Two things reminded me of the power of design and physical space this week. First, in a workshop for Juvenile Justice leaders, the 12 participants were seated at three tables. It was a cozy arrangement and the tables were useful for handling the volume of materials they were using. After a morning focused on race, class and culture dialogue skills, we brought the chairs together in a circle in the front of the room to close a segment of the conversation. I asked folks how that arrangement felt and they say “Good! !” There’s nothing like removing physical barriers and enabling everyone to see everyone else easily to foster relational and conversational intimacy! This weekend, I was sitting on my front porch with my laptop doing my IISC “homework.” Our four year old neighbor across the street saw me and her mother later told me that she wanted to sit outside because she saw me sitting outside. Eventually, she came over and offered me one of her cookies and sat on the bench with me. Her mom was not far behind and her dad came over eventually too. We had a brief neighborly chat. During this conversation, one of our next door neighbors came home—mom, dad and two kids. They all went inside and a few minutes later, mom came back out to talk with me. I was delighted and energized by these brief conversations, none of which would have happened if I had been doing my work indoors. 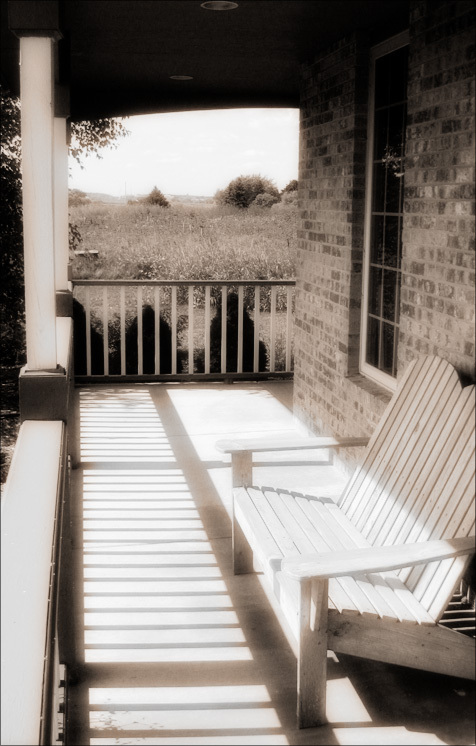 There’s nothing like a porch with a bench to create space for neighborly conversations! How are you being intentional about the physical spaces you use and create for conversations and relationships that are important in your life and your work?